29 March, 2017, Cairo, Egypt: Seven trailblazing real estate projects claimed top honours at last night’s distinguished Cityscape Egypt Awards. The Awards, a prelude to the country’s largest real estate exhibition which kicks off on March 31st until April 3rd at the Cairo International Convention Centre, was sponsored by JLL and celebrated excellence in the industry by paying tribute to real estate and architectural leaders who are making a difference in Egypt’s real estate industry. Last night’s Awards was a resounding success for winners: SODIC, who picked up two awards; Rooya Group for Real Estate Investment; Emaar Misr for Development; Al Ahly for Real Estate Development; Palm Hills Developments; and Misr Italia Properties. 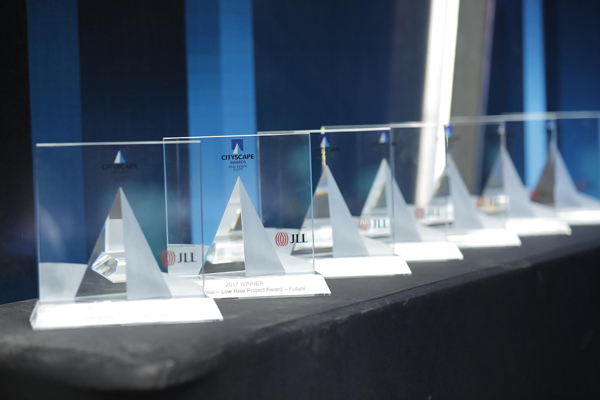 The awards featured seven categories across the following sectors: Commercial; Leisure & Hospitality; Community, Culture & Tourism; and Residential. “This award mirrors the leadership of Misr Italia Properties and the excellence of KAI Sokhna, and represents a new era in the history of the company. It is an impetus to the company and drives us to exert strenuous efforts to maintain this top position,” he added. SODIC picked up two awards in the Commercial category for The Polygon, a new city centre at the heart of Sheikh Zayed, and the Community, Culture & Tourism category for Westown Medical Clinics, comprising retail and medical space. Emaar Misr for Development emerged victorious in the Leisure & Hospitality – Future for their project Marassi, a 6.5 million sqm beachfront gated community on the North Coast of El Alamein. “It is our joy and pride at Emaar Misr, to continue to enrich the Egyptian real estate market with unique and innovative products, Marassi is a testament, evident of our promise to provide a good life to our customers and homeowners,” said Samar Zaki, Director of Development at Emaar Misr. “These developers and architects have carved a unique space for themselves in the real estate industry that’s pushing the boundaries and revitalising the industry in Egypt, and the award-winning projects exemplify these pioneering efforts,” said Tom Rhodes, Exhibition Director at Cityscape Egypt. Award winners will also be participating at the sixth edition of Cityscape Egypt, which kicks off on Friday and is set to reveal hundreds of real estate investment opportunities for prospective buyers across all price points, as well as the latest international developments. Cityscape Egypt will see the return of the Cityscape Egypt Conference, which kicks off today at the Royal Maxim Palace Kempinski, Cairo. World-leading property consultant, Colliers, will be this year’s Gold Conference Sponsor. The agenda, A roadmap to innovation: tackling project financing, marketing and design to prosper, will explore emerging trends that are redefining investment opportunities in Egypt. Some of the exhibitors at this year’s event include: Al Arabia Real Estate Development (ARCO), Palm Hills, PACT, Aloula Tameer For Mortgage Finance, Aristo Developers, Beta Egypt for Urban Development, , Capital Group Properties, Egyptian Engineering Development and Real Estate Investment, El-Batal Group, Emaar Misr, Invest4Land (API Investment), Madaar Development, Pandora Investments Public Ltd-Leptos Estates, Rooya Group, Talaat Mostafa Group Holding, Tatweer Misr, Trends Real Estate, and Wadi Degla Developments to name a few.